PBX to IT system integration is a remarkable advancement in telephone technology because it allows businesses to introduce automated processes in corporate communication. For integrating the telephone system into the existing IT infrastructure Ozeki Phone System XE is the ideal platform. This article discovers the various options and instant benefits of this integration. When you are planning to setup an always up-to-date communication system, you need to pay attention to that the telephone system should be flexible enough to work with the existing (and future) IT systems easily. It is also important that the database of the telephone system needs to be synchronised with the IT systems in order to ensure seamless information flow. This way, data can be easily accessed by any part of the telephone system. Ozeki Phone System XE is a software based PBX or also called IP PBX (Internet Protocol Private Branch eXchange), referring to an internal corporate telephone system that uses Internet protocol. It is an integrated system that allows businesses of any size to merge older communication equipment and systems with new technology. In other words, it helps connect corporate communication devices, and with the use of trunk lines it is also able to connect to the public switched telephone network (PSTN). 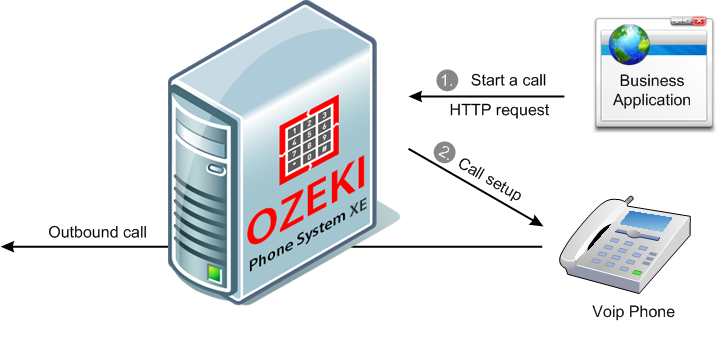 Unlike standard PBXs, Ozeki Phone System XE communicates over the Internet. Due to its great flexibility, Ozeki Phone System XE can be connected to various devices: analog telephone, VoIP telephone, mobile phone, fax machine, PC, laptop, etc. Each of these devices has a telephone number that is usually a 3- or 4-digit phone number depending on the corporate telephone number layout. They are the extensions of the telephone system. (You can read more on how to integrate Ozeki Phone System XE into the corporate communication system). Software-based PBXs are very similar to traditional PBXs since they also allow to call an employee by simply dialing his 3- or 4-digit extension. Calls arriving from external telephone numbers can also be forwarded to the extension of the intended person. The greatest advantages of IP PBXs included in the facts that they are easy to expand later and easy to maintain while they are also flexible and link with computer applications easily. Ozeki Phone System XE can be integrated into your existing telephone system efficiently. This way, you can expand the old system with further functions without any interruption in the communication service. When you use Ozeki Phone System XE you can also easily connect the telephone systems of your branch offices worldwide. You can operate them as a complex telephone system. This integration results in faster information flow and stable, reliable operation of your PBXs. The key benefit is stability: since if one of the PBXs fails, another PBX of the system can easily take over its tasks. Furthermore, the whole IT infrastructure can be integrated with Ozeki Phone System XE due to the fact that it can connect to most of the communication devices (e.g. softphone, webphone, standard telephone device, mobile phone, etc.). Ozeki Phone System XE also provides excellent SMS and email messaging functionality, voice mail service, presence service beyond further fantastic functions. Employee data administration can be really resource consuming in most enterprise resource planning (ERP) systems. For example, when a new employee is hired, the PBX configuration also needs to be modified in order to upload the information about the new-comer. Ozeki Phone System XE handles this process automatically. Ozeki Phone Systems XE allows to synchronise information between the PBX and the IT system in order to keep information updated. It uses SQL API and HTTP API to automate this process. In this way, you do not need to always re-configure your system but after integrating the PBX and the ERP system, the synchronisation can be automated efficiently. With this integration, the telephone book will be synchronised automatically. It can be ensured that the intended person can be reached easily after any change or modification in the ERP system, and the new extensions and other included devices also work properly. Automated PBX synchronisation can be critical, for example, when a new branch office is opened. Keeping employee related information up-to-date in the ERP system often requires additional resources and processes. Any change in the company affects the system: new extensions and telephone numbers need to be added, existing ones need to be modified, or old ones need to be deleted. Ozeki Phone System XE is able to handle these changes automatically due to the continuous synchronisation of its built-in telephone directory. In this way, all employees have access to the synchronised telephone directory with the latest information. Synchronised telephone directories make it easy to contact with co-workers by providing all the necessary and the latest information. Incoming calls can also be forwarded exactly to the intended person since all the contact information are updated. Ozeki Phone System XE is able to communicate with SQL database seamlessly. The database can include SIP accounts, logs, dial plans and further information in the system. As a result, data related to older conversations can be easily tracked (e.g. caller and callee ID, time of the call, duration of the conversation, etc.). In case there are calls arriving from a website (using softphone or webphone), it is also possible to know from which website the caller initiated the call. With the gained data useful statistics can be made in order to improve sales and marketing results. In case you have softphones on your website, you will know which of the webpages is the most attractive for visitors and which of them needs some development. A wide range of data can be collected in order to improve customer services. Customer Relationship Management (CRM) and Enterprise Resource Planning (ERP) systems have a great effect on productive corporate processes and operation. Ozeki Phone System XE is able to work with CRM and ERP systems in order to ensure efficient marketing, sales, customer services, call centre services and resource management. By automating the synchronisation between the CRM/ERP and Ozeki Phone System XE, changes in corporate structure (opening new offices, hiring new employees, etc.) can be followed easily. 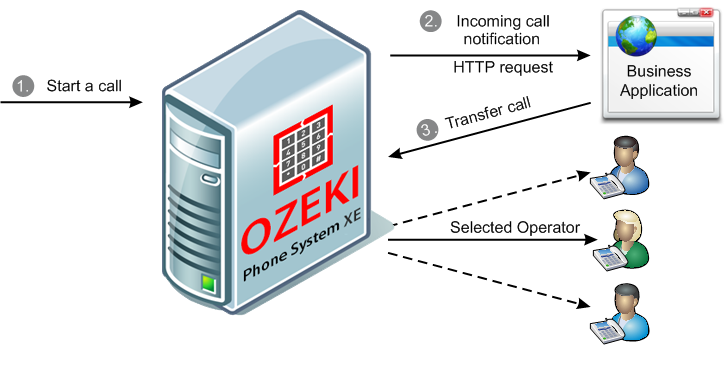 Due to its flexibility, Ozeki Phone System XE can also be accessed using an external API (HTTP API). The dial plan rules can also be automatically modified in case of any changes occur (e.g. an employee is out of the office). This way incoming calls arriving to the desktop phone of the given employee can be easily forwarded to the device on which he is available at the given time. This device can be his mobile phone, voice mail, extension of a co-worker, etc. For safety reasons, it is also possible to block the access of employees, who have left the company, from the corporate phone system. This way, their usernames and passwords, and even their extensions can be deleted from the system without interruptions in the service. It is important to ensure the support of multiple communication channels, platforms and device classes and to exploit all the advantages they offer. Ozeki Phone System XE can be efficiently connected to desktop, mobile and web based platforms, as well. After connection, the latest data and information will be available on all of the connected devices, due to the automatic synchronisation. How to integrate mobile extensions into the corporate telephone system? How can a Webphone help to achieve efficient contact with your customers?